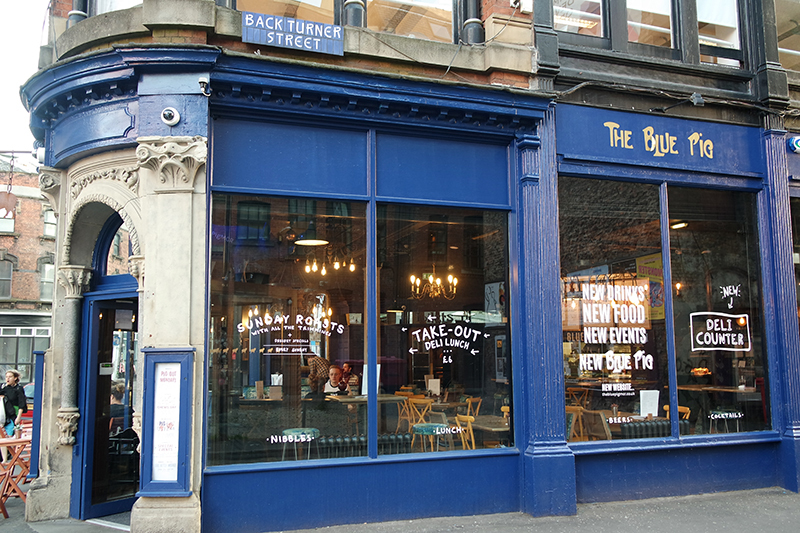 If you're familiar with Manchester, you'll have undoubtedly come across The Blue Pig before. This pretty blue traditional-looking pub sits in the heart of Manchester's Northern Quarter, close to the market side of the Arndale centre. 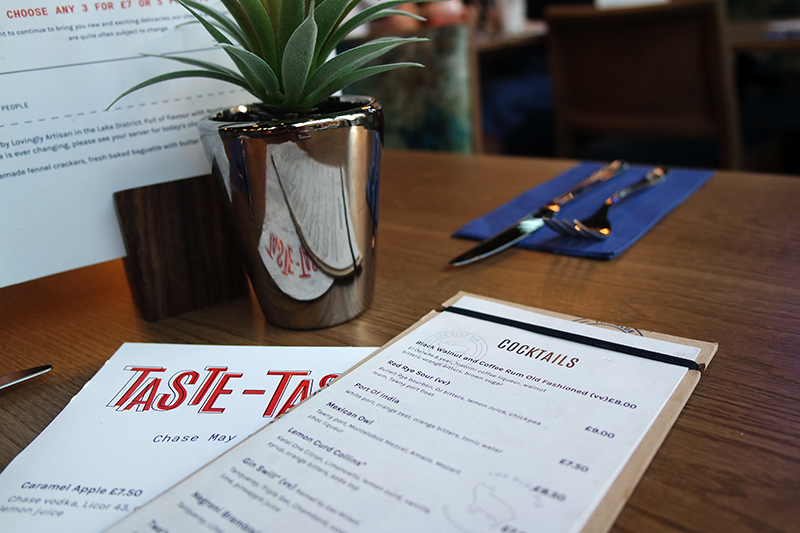 Not necessarily known for food previously, other than maybe a quick bowl of chips or a Sunday Lunch, The Blue Pig have relaunched their food and drinks menu with a fresh new take on pub fare! With this NQ stalwart under new management, I was happy to oblige when asked to visit to check out their new offerings*. The new menu is perfect for grazing (my favourite kind of eating!) 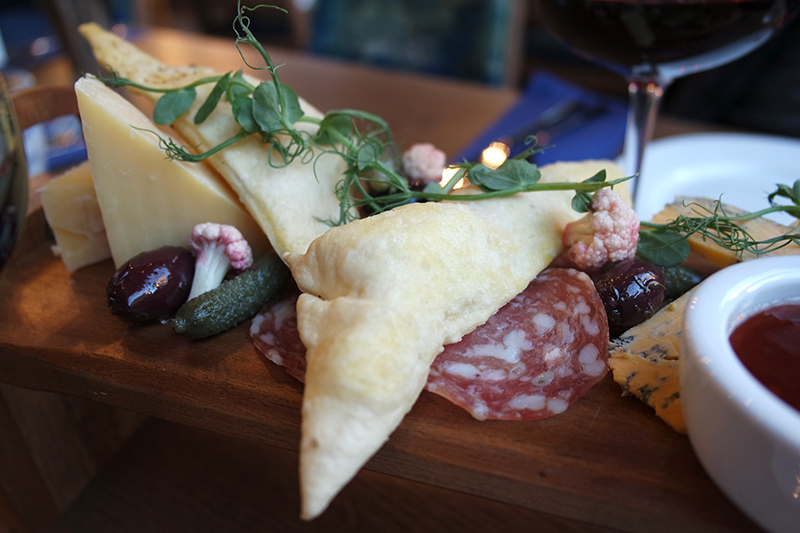 with their main 'Deli Menu' centred around charcuterie boards. 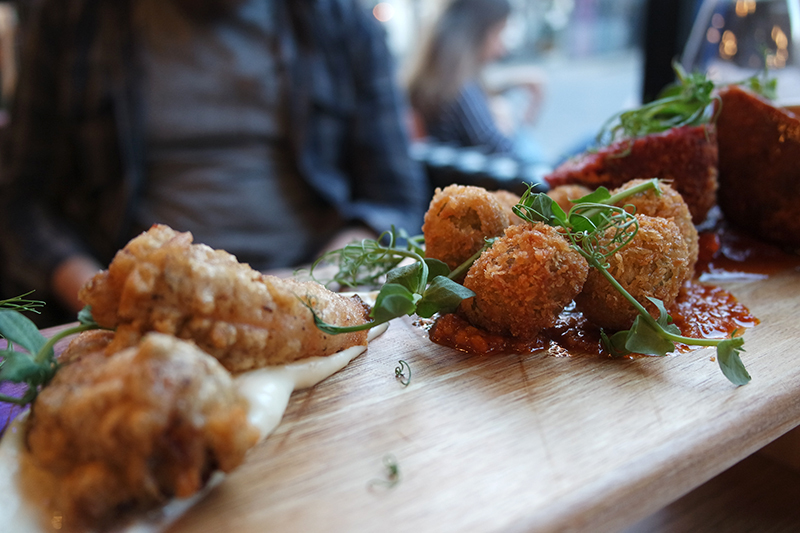 With a menu packed with a huge selection of cured meats and cheeses, artisan breads, pate and terrines, seafood and small plates - and all reasonably priced - this was right up my street. 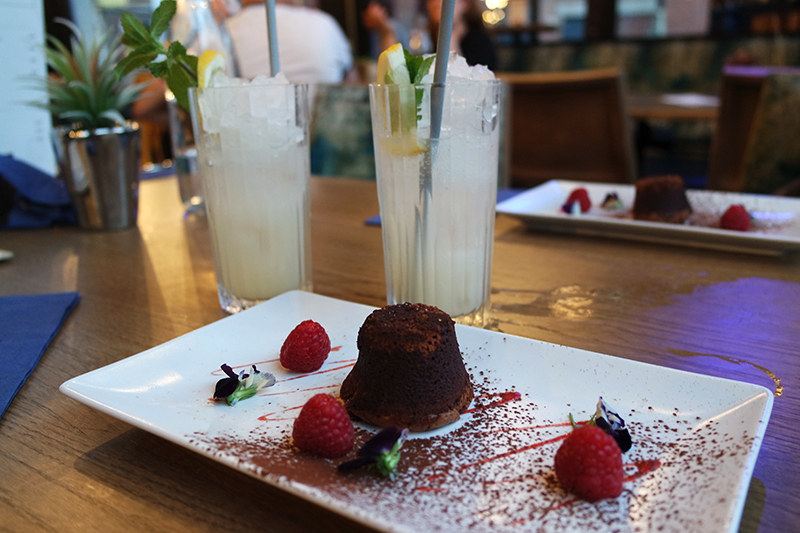 We were treated to a 'tasting' evening to sample the new menu, trying a mix of some of the hero items, expertly paired with complementing drinks too. 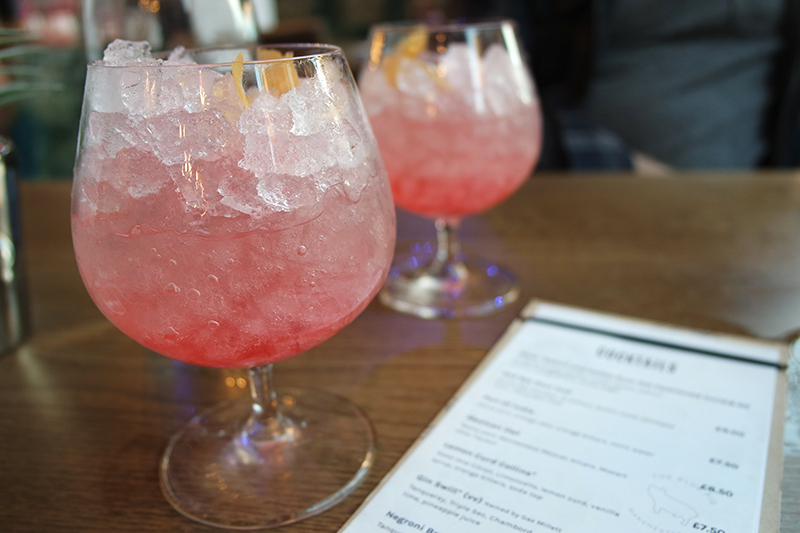 To whet our appetite, we started with a cocktail: the Negroni Bramble - a refreshing mix of Tanqueray gin, Lillet and Pampelle grapefruit liqueur. This was paired with pork crackling with fennel and coriander. This was incredible! I love pork crackling and you could tell some effort had gone into this. We were told that this was made with the Sunday Roasts at the weekend. It was so tasty and crispy - and huge! 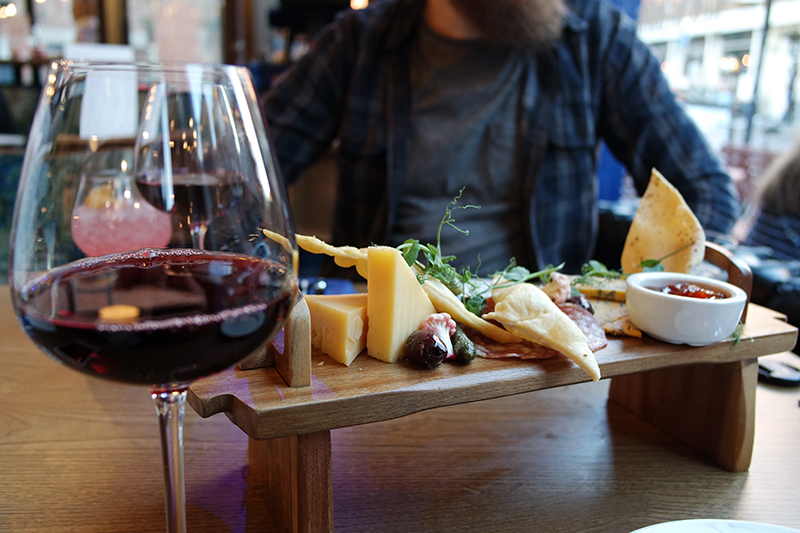 Next up was the best bit for me - cured meats, cheeses and crackers! 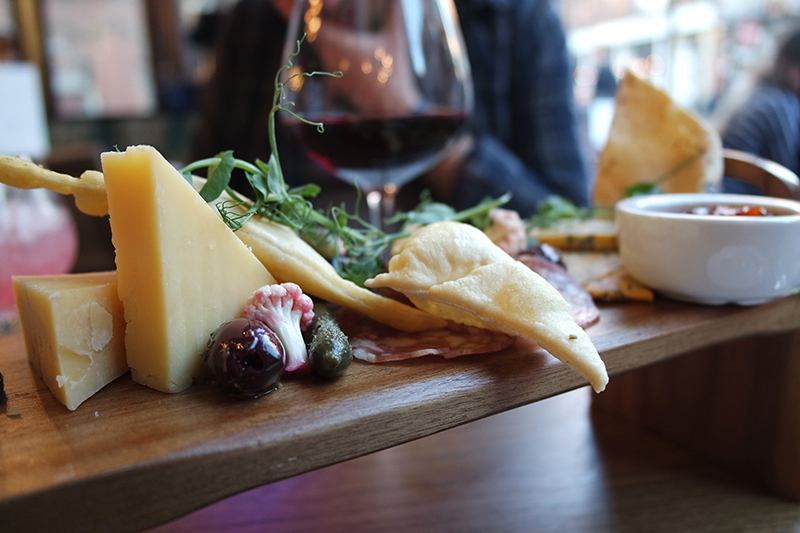 This board was amazing; piled high with salami, extra mature cheddar, red Leicester, homemade fennel crackers, pickled vegetables and chilli jam. You could taste the quality in all the components. The fennel crackers and cheeses in particular were really good. Accompanied by a large glass of Spanish house red, this was definitely my favourite course. 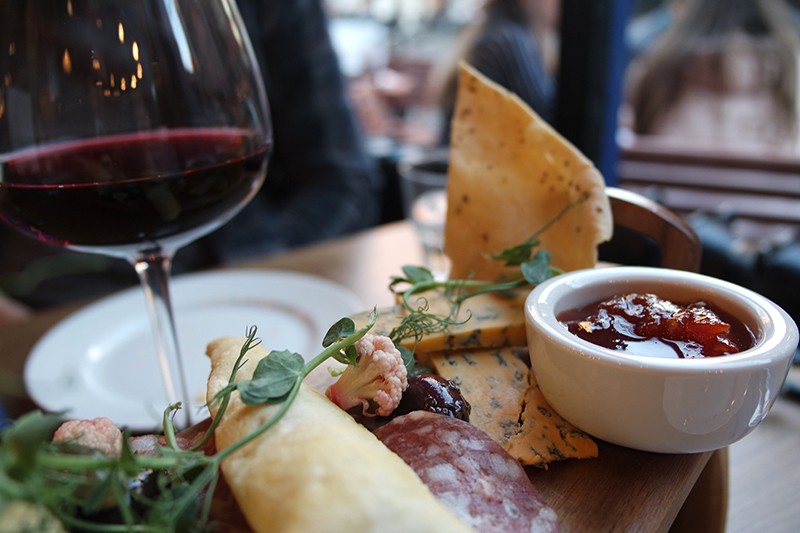 You can't beat cheese and red wine! Continuing our feast was another sharing board! This time stacked with nibbles from the Small Plates and Seafood dishes. The biggest eye-drawing item on the board has to be the vegetarian scotch egg! Created with a runny duck egg in the centre, sat atop ginger and rhubarb jam and encased in a beetroot falafel shell. 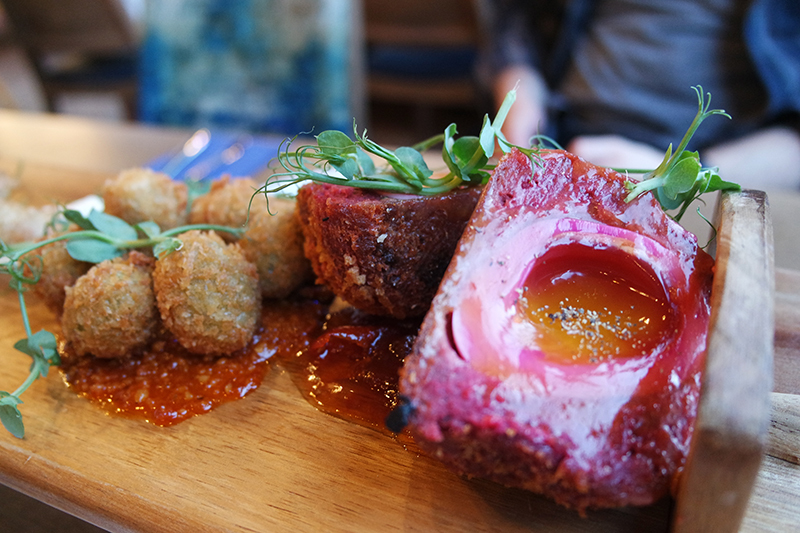 As beautiful as this looked, it just wasn't for me - I think I love real scotch eggs too much! I found the beetroot falafel a little bland but the egg in the centre was gorgeous. The board also featured feta-stuffed crispy olives with romesco sauce. I actually don't like olives but the beautiful sauce, creamy feta and crispy coating made these just about okay which is a big win for me! 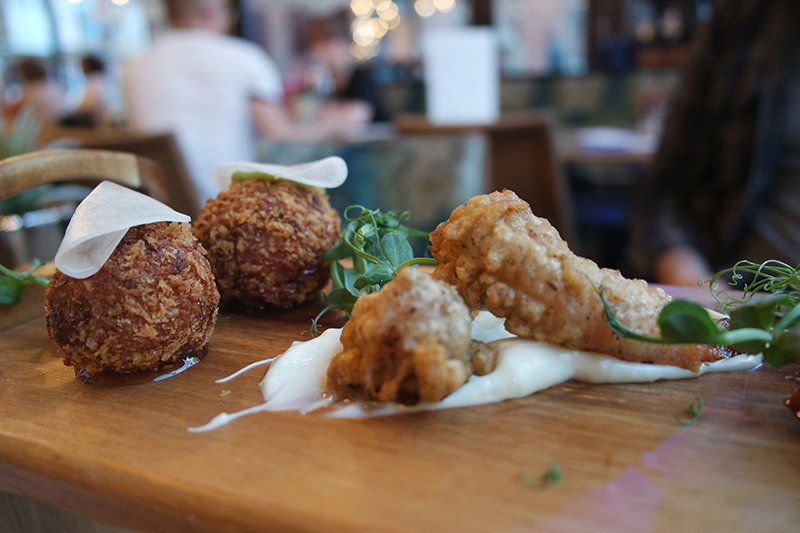 My two favourite items were the tempura jerk prawns with citrus mayo and the Asian pork bon bons with pickled mooli and wasabi. The jury's out on which dish I favoured most - both were delicious. Did I know what mooli was? no (it's a type of radish, by the way); did I care? Absolutely not, it complemented the sweet and tender pork bon bons perfectly. The prawns were also awesome; lightly battered with great seasoning and a bit of a kick and juicy inside! Last but by certainly no means least - dessert! 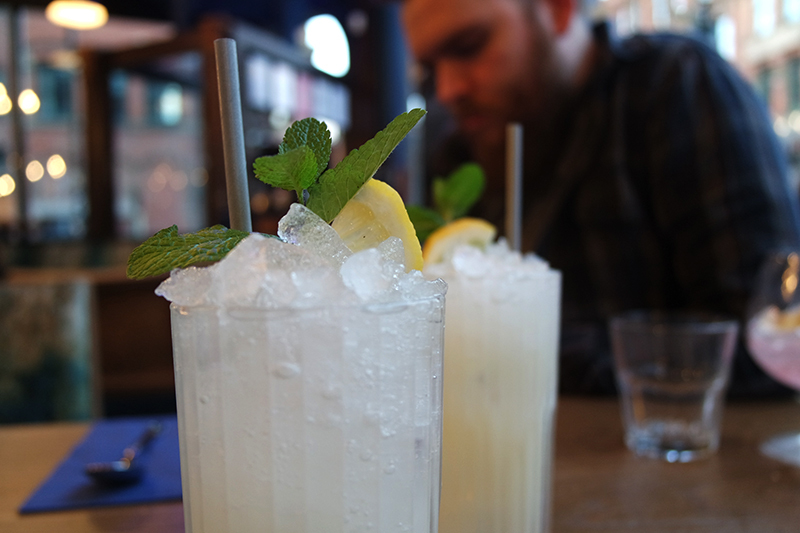 Our dessert was paired with a superb cocktail - the Lemon Curd Collins. Created with Ketel One Citron, Limoncello, real lemon curd, vanilla syrup, orange bitters and a splash of soda, it was both refreshing and sweet - the perfect palette cleanser. 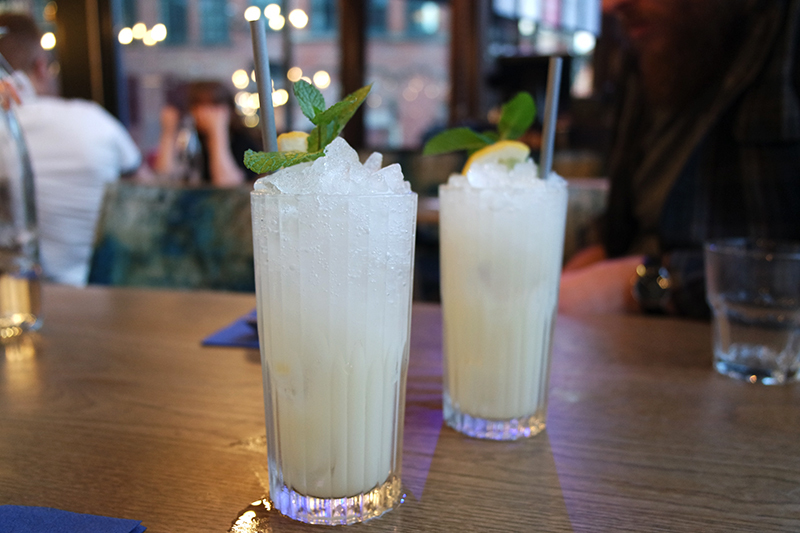 I'll definitely be back to order a round of these! Then the pudding, oh the pudding. 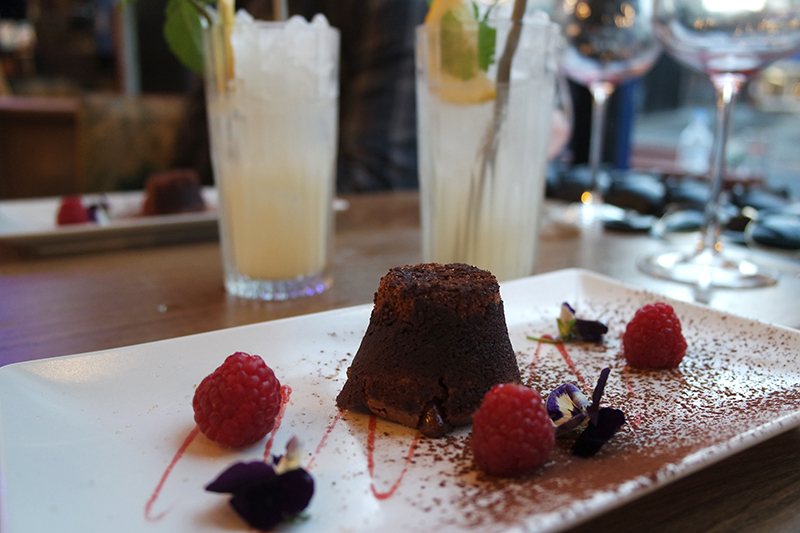 A classic chocolate fondant is one of my firm favourites and this one was wonderfully rich and gooey on the inside as it should be. The perfect size too to top of our tasting evening. 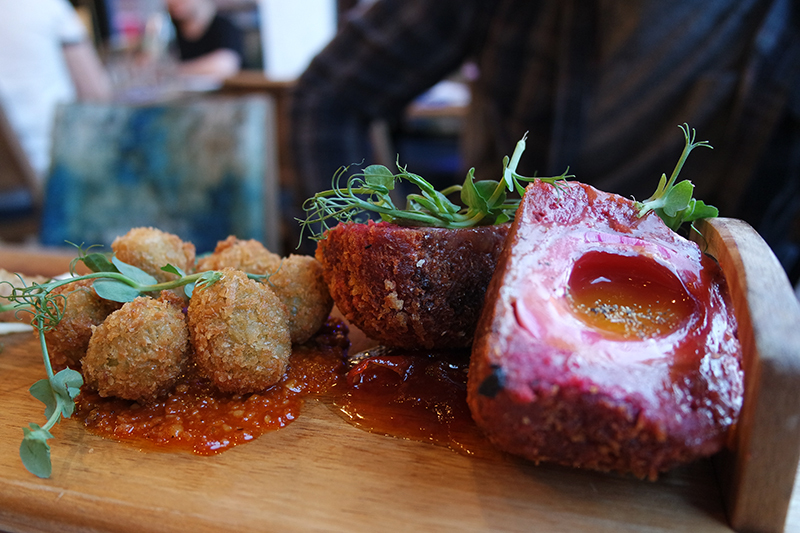 All in all, I was thoroughly impressed with The Blue Pig's new menu - I never expected to find food like this in such a setting. 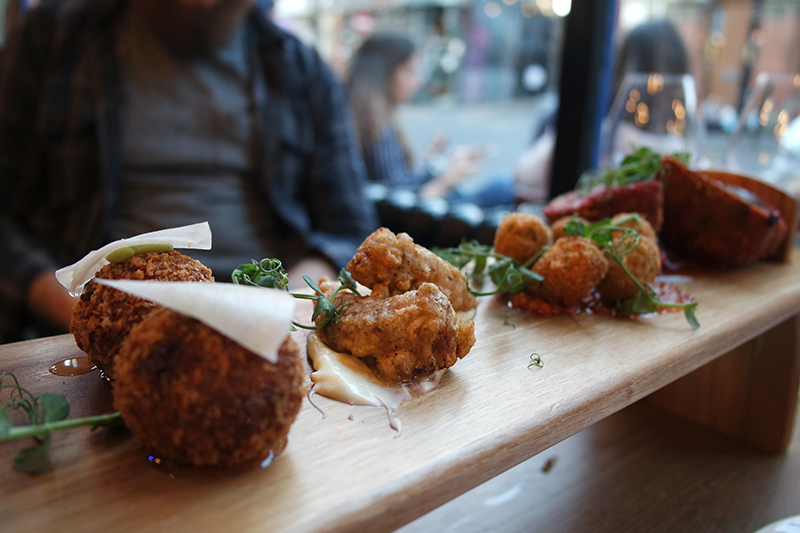 I'm ashamed to admit that I would have happily walked by The Blue Pig previously and would never consider visiting for something to eat but the quality, care and thought that's gone into their new menu is incredible. 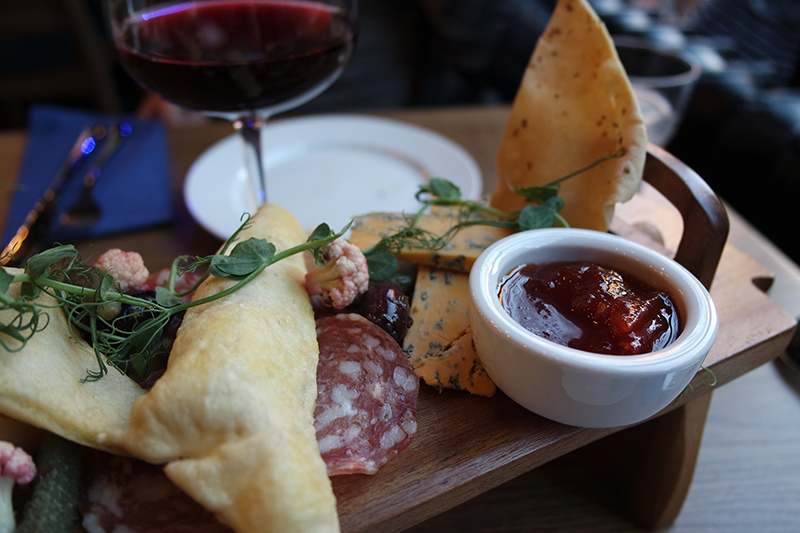 There's so much on the menu that I know I'll love so I can't wait to go back, especially as everything is so reasonably priced - like their all-day charcuterie and cheese board offer of any 3 for £7, or 5 for £10. 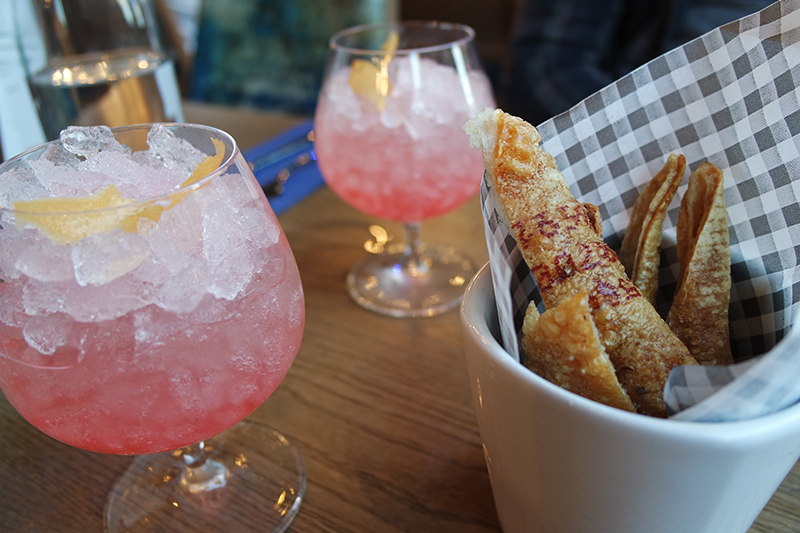 It's the perfect sharing lunch option for a catch-up with friends over a few cocktails! 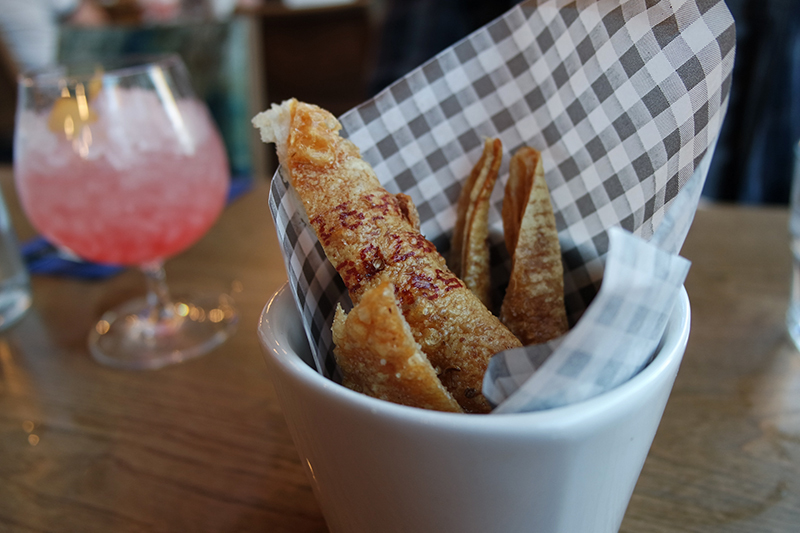 Have you ever visited The Blue Pig for food and would you go back for this new menu?